Leading of delta dvp60ec plc and programmable logic controller from Coimbatore. We are offering Delta DVP60EC PLC. Through serial ports, EC3 is able to connect to control devices such as PLC, frequency inverter and temperature controller, which can be said to be a programmable application solution that is cost-friendly and highly reliable. Built-in 4 points of high-speed counters. We are offering Programmable Logic Controller. 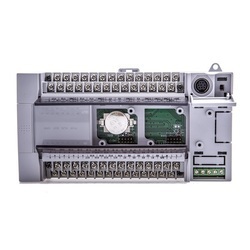 Offered Programmable Logic Controller provides optimum functional support and features liquid crystal display program controller with maximum of 15 patterns and 99 steps. Further, the choice of multiple inputs of Thermocouple (13 types), RTD (2 types), Voltage (5 types), Current (1 type) also makes these deliver convenient operations.